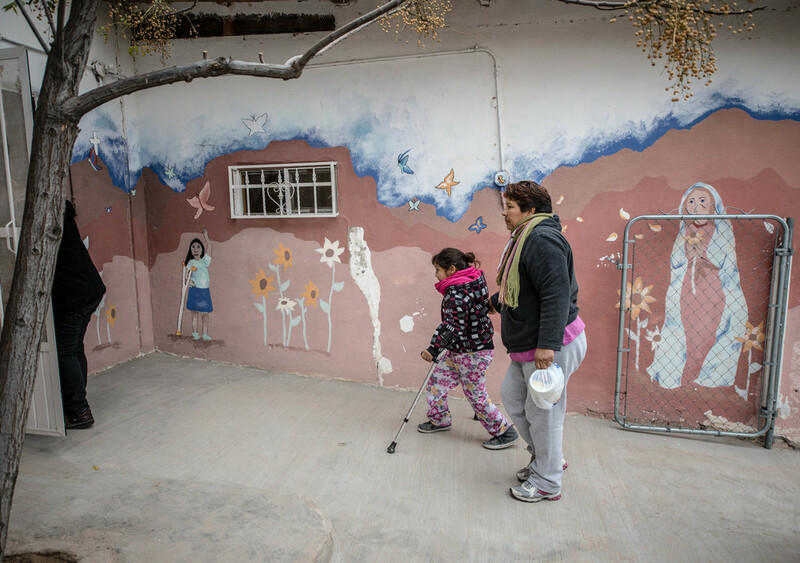 ANAPRA, Mexico – One frigid Saturday morning in a neighborhood at the rough edge of Ciudad Juárez, a cheerful group of mothers and children, many of them with special needs, gathered at a clinic founded and run by New Mexico’s Sisters of Charity. A few mothers tended chiles and potatoes on the stove while the children played Candyland near an artificial Christmas tree, while others helped out feeding the youngsters who cannot feed themselves. Behind a curtain dividing the two-room clinic, mothers and one father performed the physical therapies the nuns have taught them, as they struggle – with spare resources – to care for their children with Down syndrome, cerebral palsy, autism and other conditions. Proyecto Santo Niño began in 2003 as a free health clinic where Dr. Janet Gildea, a Catholic sister and family practitioner, offered medical services to one of Juárez’s most troubled and impoverished areas. Over time, it evolved to specialize in providing physical therapy to poor families with special needs children, an especially needy group that is often underserved by Mexican health services. Today, the clinic serves some 30 families who flock there from all over the city. Gildea and two other sisters, Carol Wirtz and Peggy Deneweth, teach the parents that they are the ones best-suited to perform the therapy – physical and sensory exercises, reiki and other therapeutic activities – because they know their children best, and they can practice what they learn at home. “Sister taught us how to do physical therapies but also reiki,” Trejo de la Torre said. In reiki, practitioners place their hands lightly on or just above a person, with the goal of taking advantage of the person’s own healing response or energy. “It’s been wonderful because it goes much deeper, and the children are very relaxed, very tranquil,” she said. The morning’s high spirits and holiday cheer masked the week’s double tragedies. Just a few blocks away, a family held a wake for a special needs child who had died the day before. The children are so fragile, Gildea says. So is life in a city that until recently had been the central battleground of a brutal drug war and where the violence, although greatly reduced, continues. Another special needs child lost her father and cousin earlier that week to gunfire. The concrete-block clinic had no running water when it opened a decade ago. Neither did many homes in Anapra, a settlement that has gradually become part of greater Juárez. The city eventually paved the main road and delivered basic services, although most offshoot roads are dirt and pocked with holes. Three days a week, the Sisters travel from La Union, N.M., in Doña Ana County, over the border and into Anapra. Gildea says she founded the clinic to offer family medicine to the community, but that changed when a woman arrived with a severely underweight newborn, a “peanut-sized baby,” she said, with Down syndrome. The woman came again and again asking for help and advice on how to care for him. While brothers and sisters play on one side of the clinic, the therapy begins in the other room. Juan Martinez Treviño, his 12-year-old daughter and 15-year-old son attend to Luis Pablo, who is 16 and suffers from a severe form of cerebral palsy. His arms and legs are thin as bone and, stretched out on a bed, he fills only half of it. The family prepares him for hydrotherapy: a relaxing dip and massage in the clinic’s hot water jacuzzi. Trejo de la Torre pitches in, as does another mother, together lowering Luis Pablo into the water but holding onto him firmly. He cannot speak or walk or hold himself upright, but he grins and shrieks with joy in the bath. In the opposite corner, three women – all mothers whose special needs children have passed – lay their hands on Oscar, a 3-year-old with an unidentified syndrome; his mother, Maria Eugenia Valverde Diaz, lost two previous sons to the same affliction. The women are quiet as they practice reiki, and Oscar dozes. Photos of their children who have passed are pinned on the wall beside them. That is the spirit of the place: All of the parents, most often the mothers, care for each other’s children and lean on one another for support.